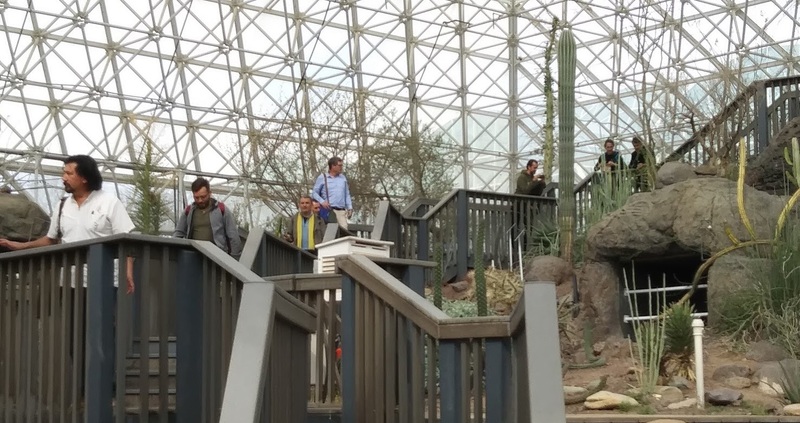 Biosphere 2, an immense scientific project born in the 1980s, is a miniature version of our planet recreated in the middle of the Arizona desert. 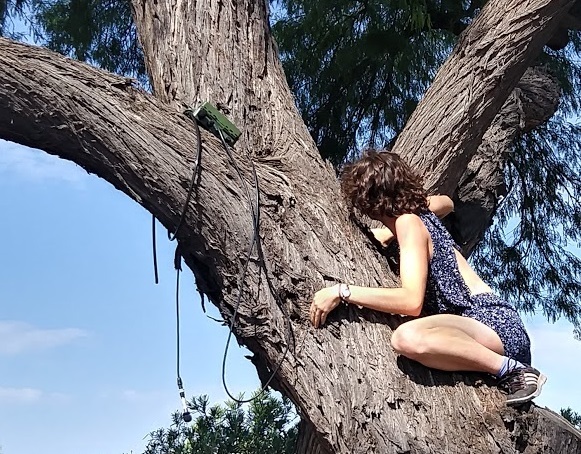 Initially intended to prepare for stays on Mars or the moon, the prototype is now used to conduct environmental research and anticipate how ecosystems adapt to climate change...continue reading. The University of Arizona Biosphere 2 consists of a large-scale experimental apparatus housing seven model ecosystems, including a 2600 m3 ocean, a team of multidisciplinary scientists, a broad science education and public outreach program, and a modern conference center. 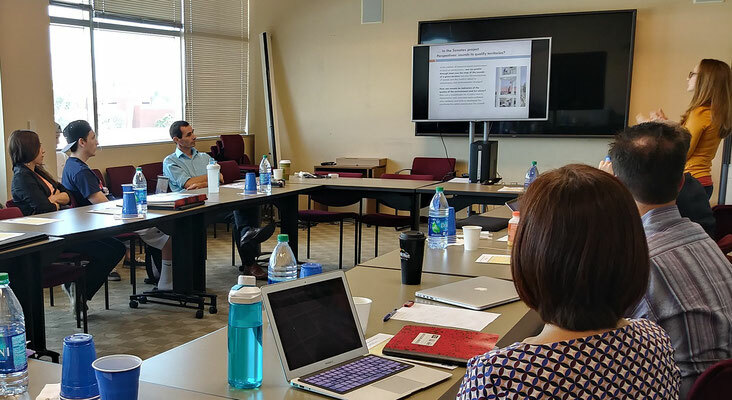 A workshop jointly hosted by UMI iGLOBES, CEMCA, and the Udall Center for Studies in Public Policies. 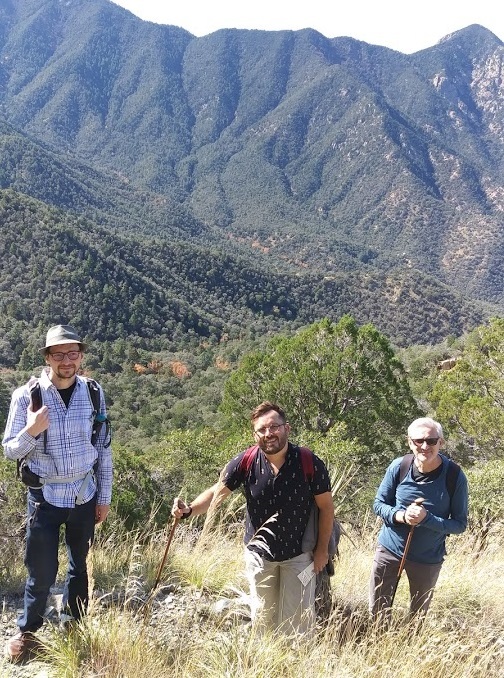 Visiting scholars (in order) Stéphane Tonnelat, Raimundo Nonato Junior, Jean-Christophe Pereau, Anne Sourdril and Luc Barbaro climbed up to 6700 feet in the Santa Rita Mountains. In collaboration with the Confluencenter, the Desert Lab's project is investigating the values and meanings hikers/visitors ascribe to Tumamoc Hill. 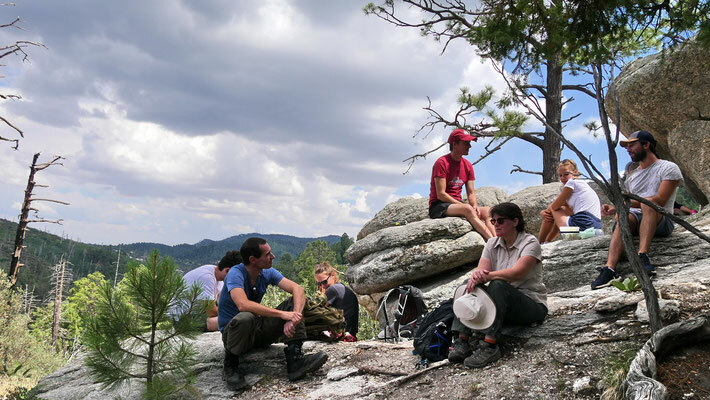 Although research on the hill has been ongoing for decades, most studies focus on the ecosystem on the hill, or they attempt to interpret archaeological data from the hill in order to understand the social and cultural practices of past inhabitants. 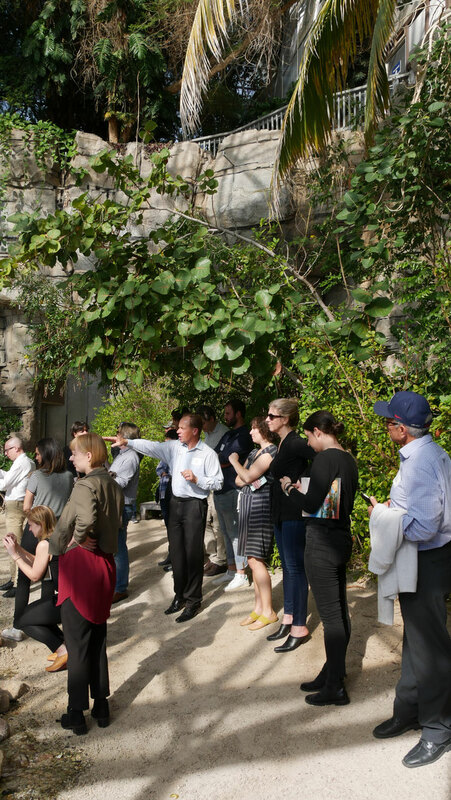 Few studies have systematically investigated what the site means to the hundreds of its daily visitors. 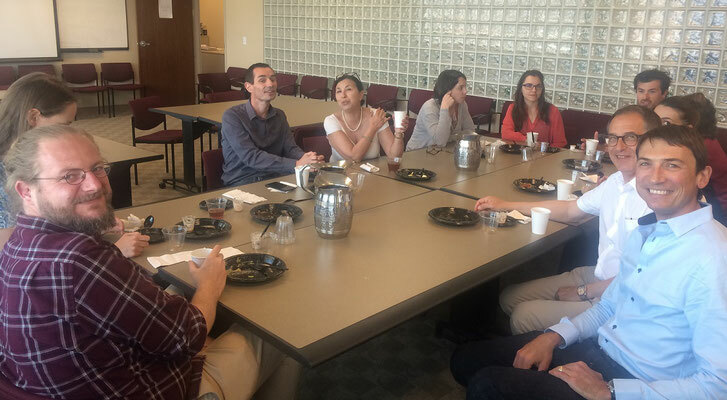 Ultimately, the goal is to understand and describe the cultural relationships between a public site’s resources and the communities it services. PRESENTATIONS WENT WELL at the observatory workshop in france! Other presentations : the SONATAS project by Luc Barbaro & Anne Sourdril on the Tucson region soundscapes, the Borderland Arizona/Sonora project by Anne-Lise Boyer and Claude Le Gouill on the role of mining activity in the evolution of the transborder region. Laureate of the Laboratory for Excellence project in the program « Investment in the future », the DRIIHM LabEx is currently centered around 12 Man-Environment Observatories, including the Pima County Observatory, and is meeting this year in Marseille, France. 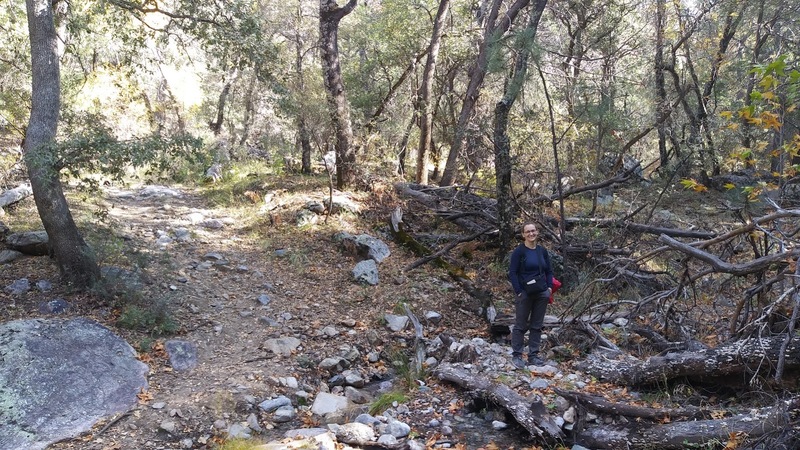 Adriana Zuniga, a University of Arizona Senior Lecturer, will be presenting a project: the State of the Cienega Watershed. 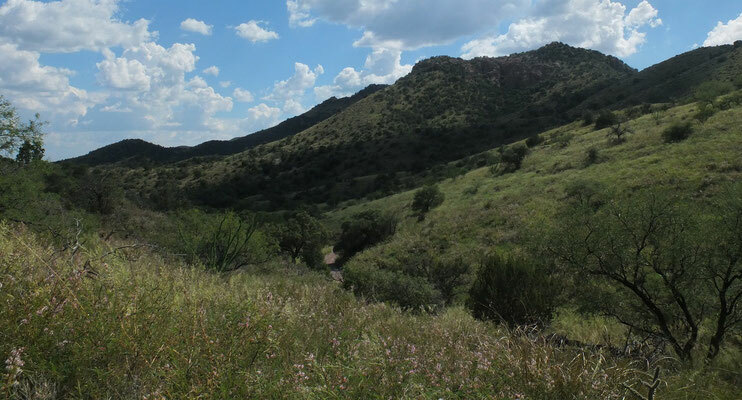 The Cienega watershed has a great value to the local community because it contains one of the last perennial creeks in Southern Arizona and provides critical habitat for the survival of many species, including some threatened and endangered. 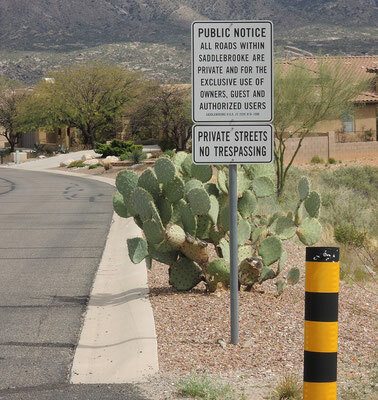 It is also very important for ranchers and visitors to beautiful recreation areas, and because it provides clean groundwater and flood control benefits to the City of Tucson. 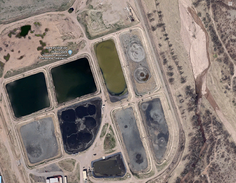 Lately, there have been concerns for the health of this watershed because of the opening of the Rosemont Mine that will be located in this watershed. The purpose of this project is to measure the state of the health of the watershed before, during, and after the mine starts operations. To increase awareness among ENS/PSL students about research and training opportunities at the UMI and in UA partner laboratories, Regis Ferriere presented iGLOBES to ENS/PSL new and returning students during their orientation. 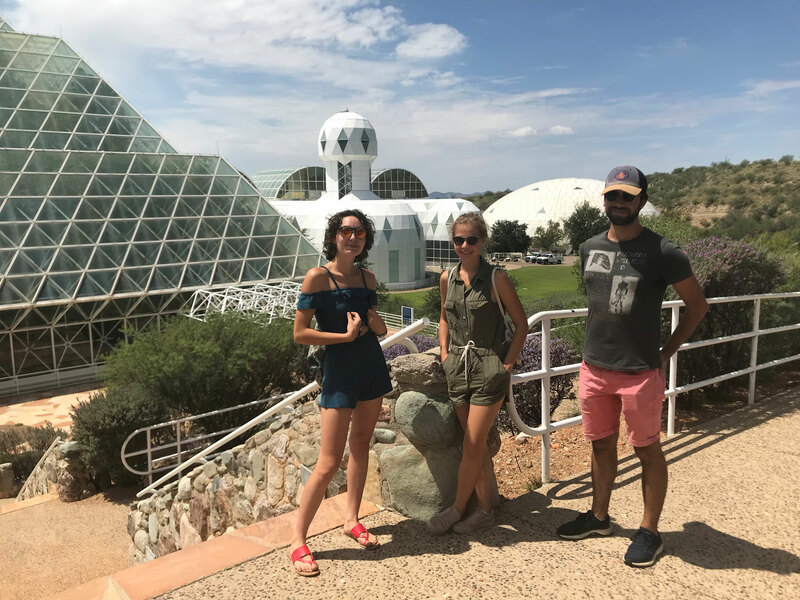 A most unique facility, Biosphere 2 is dedicated to research, outreach, teaching and life-long learning about Earth, its living systems, and its place in the universe. 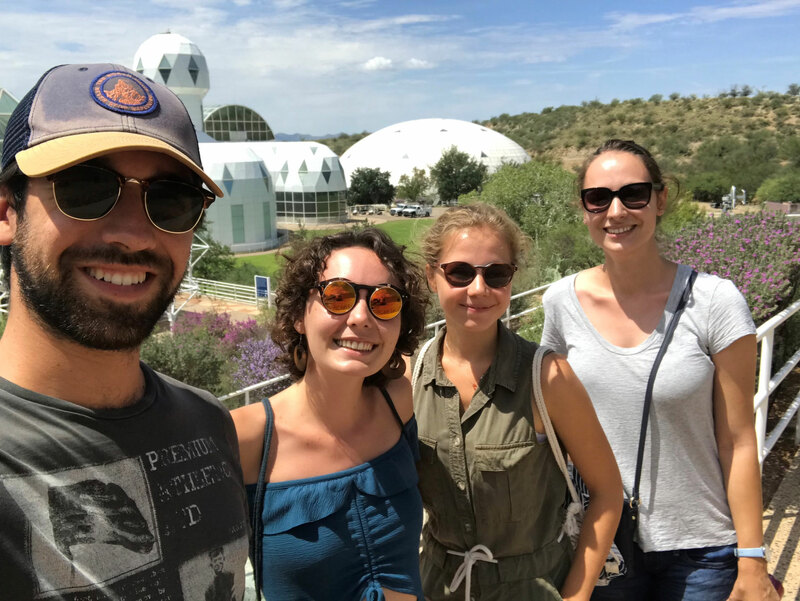 French visiting students Anne-Lise Boyer, Amélie Latreille, Brian Levardon and Lisa Vincent discovered this amazing research center. 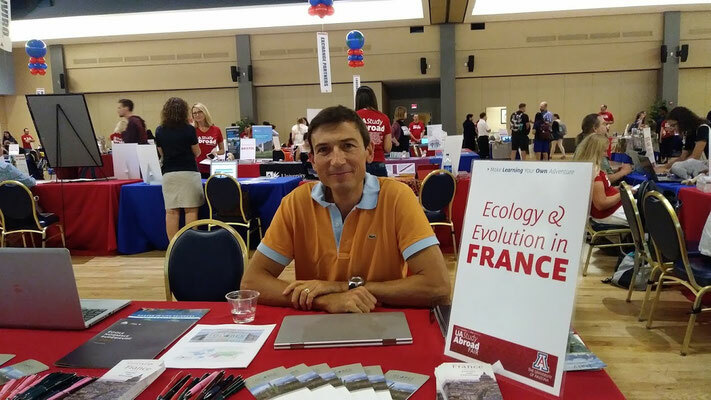 Axel Rodriguez, an ENS Master student from AgroParis Tech, is pursuing his dual ENS-AgroParisTech diploma. 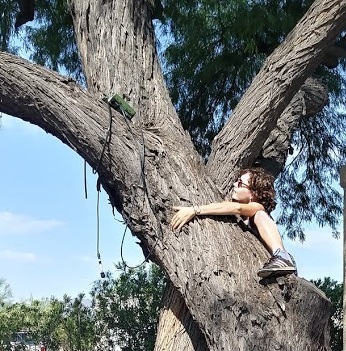 This year (2018-19), he will validate his Master degree by taking classes and doing research at UA. 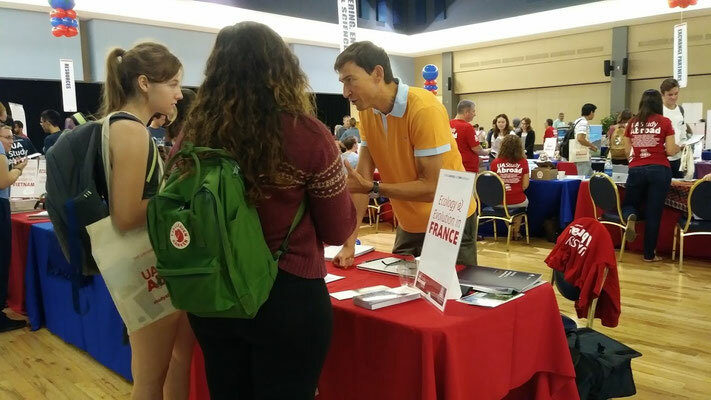 Thanks to our partnership with PSL University, iGLOBES is providing support for Axel’s visit in Tucson and studies at UA. 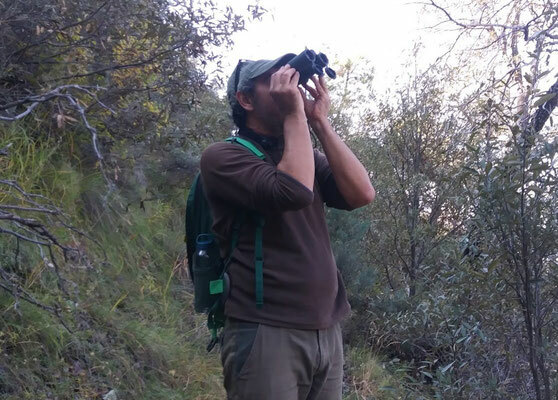 NSF Grant on "Eco-evolutionary Drivers of Diversity in Toxic Algal Blooms”. 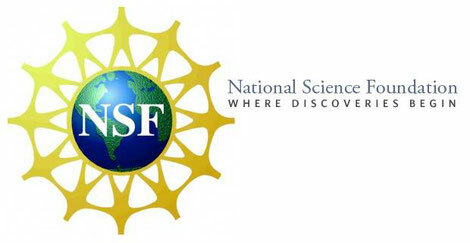 Regis Ferriere, UMI Director and Professor at the University of Arizona as well as the ENS in Paris, and Jen Wisecaver (Purdue University) just received a NSF Dimensions of Biodiversity five-year grant titled "Eco-evolutionary Drivers of Diversity in Toxic Algal Blooms”. 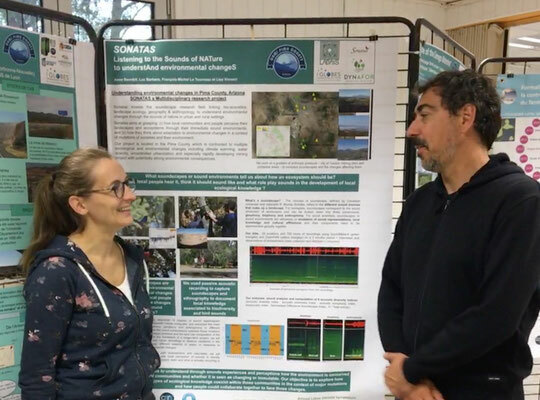 The research will combine ecological, genetic and phylogenetic data, both observational and experimental, with mathematical and computational models to decipher the structure and function of eco-evolutionary feedbacks in blooms of toxic algae, using the haptophyte Prymnesium parvum as a focal species. 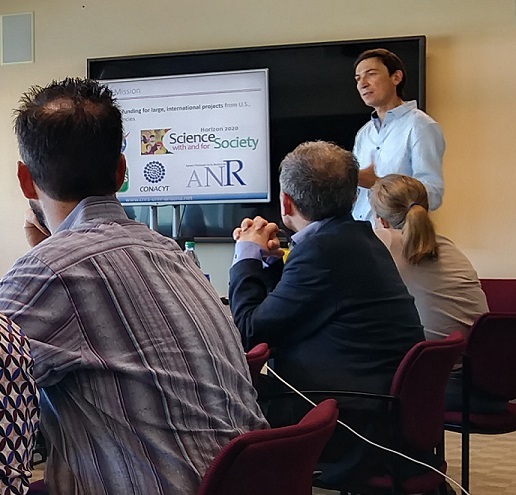 The project also includes Will Driscoll (PSU) as a Collaborator. Jen Wisecaver and Will Driscoll are both alumni of the UA Ecology and Evolutionary Biology Department and worked in Jeremiah Hackett’s lab, receiving their PhDs in 2012. Elsa Abs is a fourth-year doctoral candidate, working between UA and ENS on the integration of biology into models of global climate change. 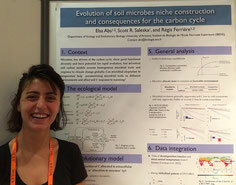 With support from the UMI, she was able to participate in Evolution 2018, a major annual conference in the scientific community, held this year in Montpellier, France. 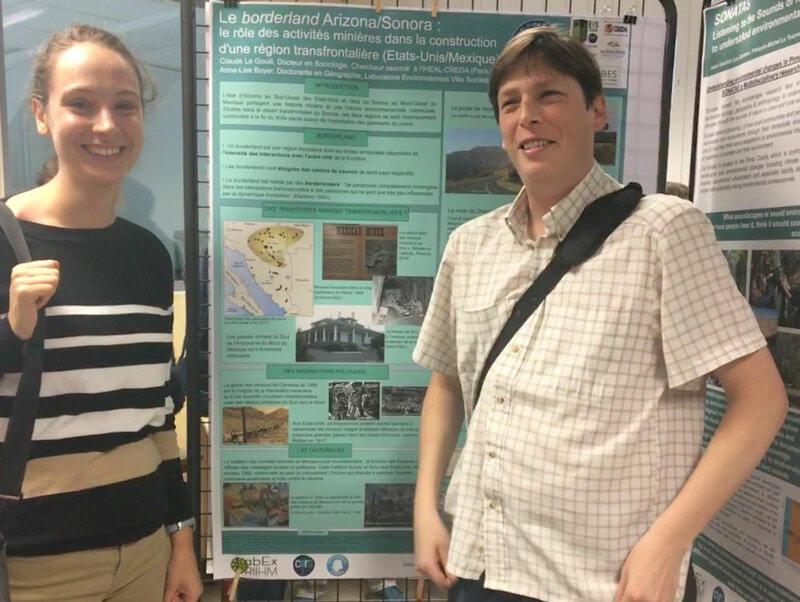 Amélie Latreille, a French student doing research in Tucson over the summer, is studying wastewater issues in Ambos Nogales, a transnational town located on the US-Mexican border, and evaluating the rehabilitation projects funded by the North American Development Bank. What are the goals of the projects? 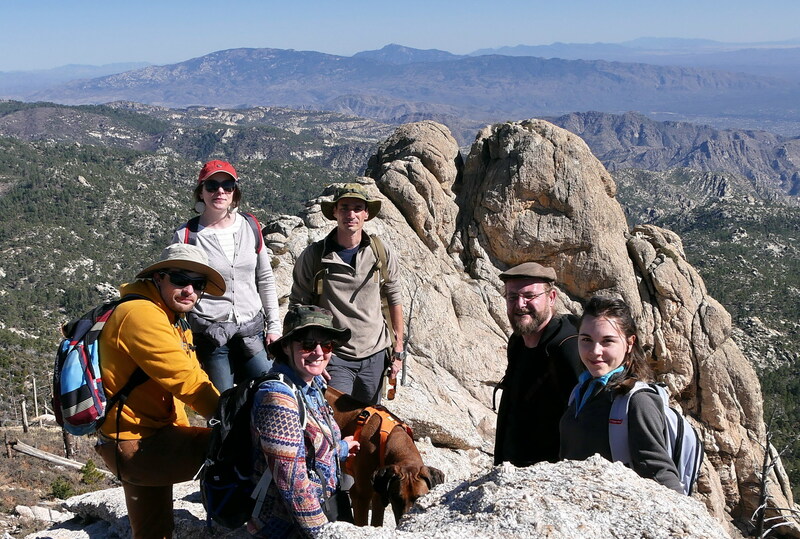 Escaping the Tucson heat, we went up Mount Lemmon and hiked one of the trails. What does the rosemont mine site look like? 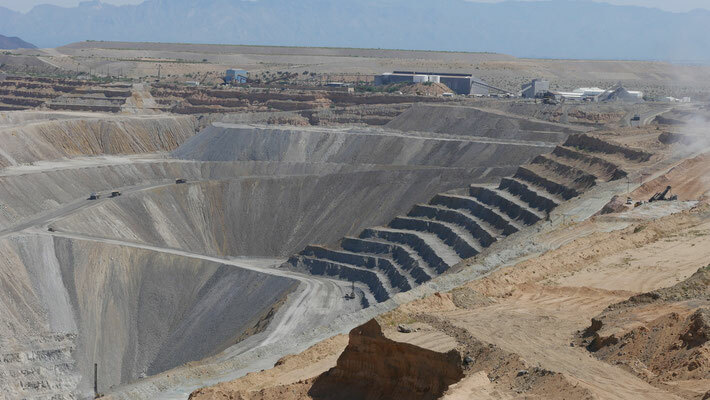 The Observatory's focus is the territory that will be used to open the Rosemont copper mine. What does it look like right now? François-Michel Le Tourneau took Anne-Lise Boyer, Amélie Latreille and Brian Levardon on a trip to check it out. 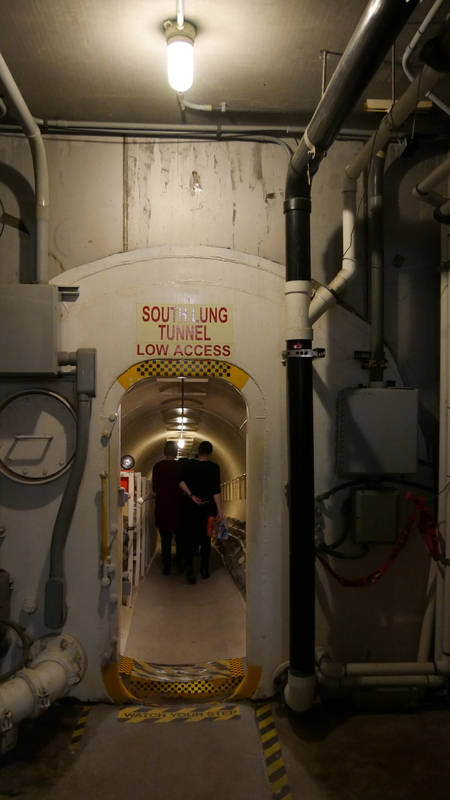 Click here for more information on the Observatory. 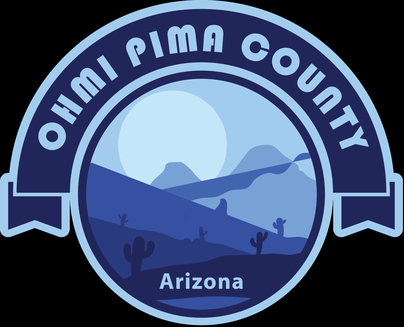 what can the sounds tell us about pima county (2)? 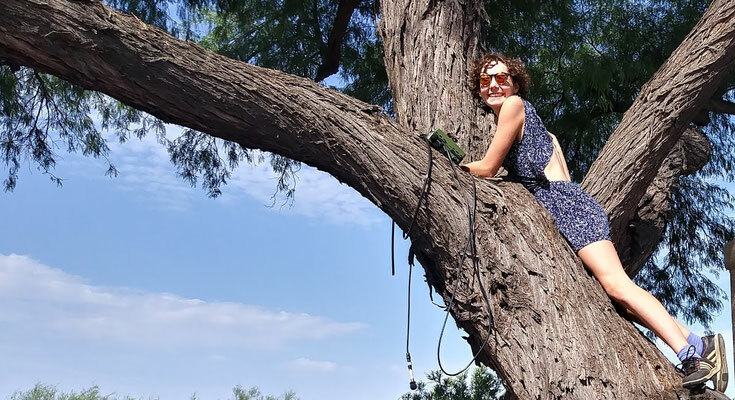 Lisa Vincent, a French student doing research over the summer in Tucson, climbs up the tree to retrieve the microphone she put up there for the SONATAS project, hoping it will have recorded the monsoon rains and lighting from the weekend. The Mexican company Asarco’s domestic mines, 3 of which are in Arizona, annually produce approximately 350 to 400 million pounds of copper. 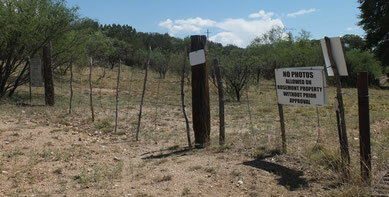 The one we visited south of Tucson should be in production for another 25 years. 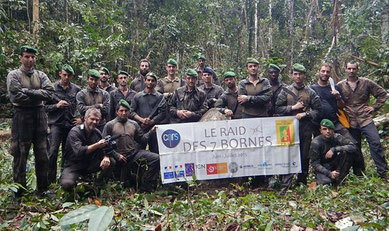 The Embassy of France in Washington DC put on a screening of the French documentary "A Frontier in the Jungle," the 2015 320 km trek along the border between Brazil and French Guiana during which three scientists, accompanied by a group of French Foreign Legion soldiers, took a harrowing 6 weeks to find the "seven stones" of the border and collected important data about the ecology and the history of the area. See program information. 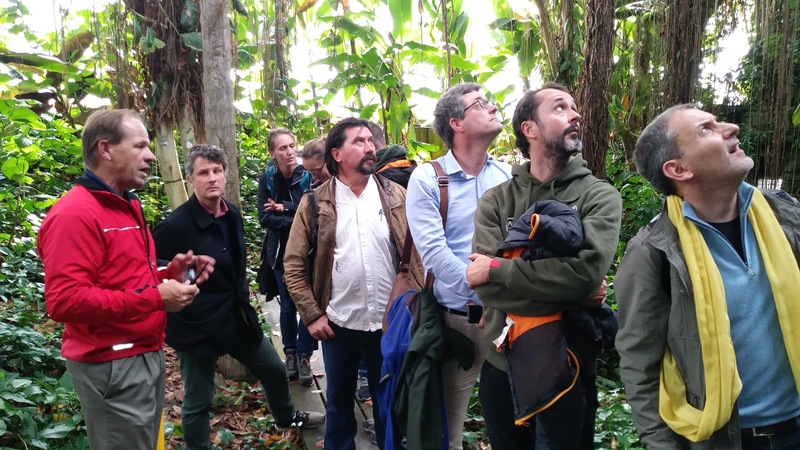 It was followed by a discussion with François-Michel Le Tourneau, a CNRS researcher and the UMI Deputy Director who initiated the project and Thomas E. Lovejoy, U.S Science Envoy in charge of wildlife and biodiversity conservation. Claude Le Gouill and Anne-Lise Boyer came back from a field trip that took them to the mining towns of Cananea and Hermosillo, the capital city of the Mexican state of Sonora. 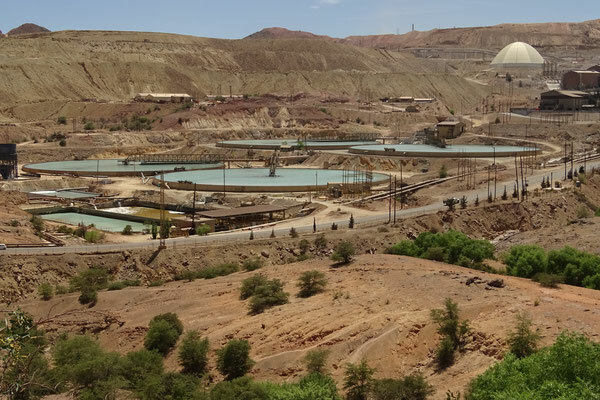 They met with professors and students of the Instituto Technologico Superior de Cananea and the University of Sonora to pursue their survey on how the mining industry contributes to binding Southern Arizona and Northern Mexico. 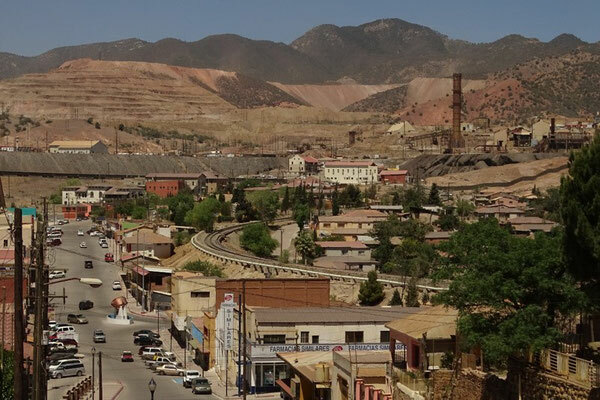 The case study of Cananea is quite interesting in that the city’s mining heritage is strongly intertwined with the history of the American Southwest. Located below the open-pit, the city still shows the legacy of the company town built at the beginning of the 20th century by W.C. Greene, a rich investor from New-York. 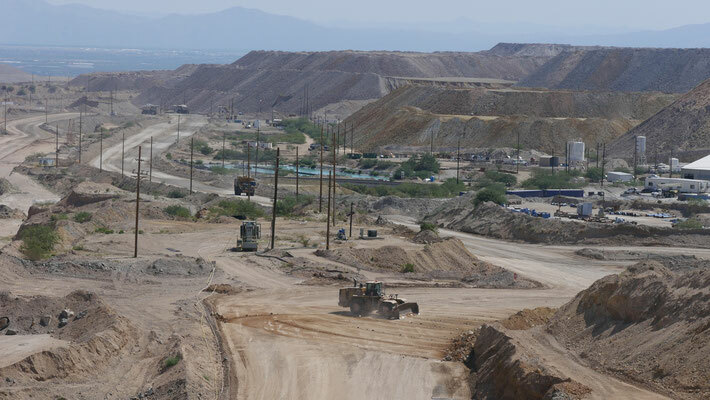 Today, the Cananea mine, operated by Grupo Mexico, attracts workers from southern Mexico and engineers from North America and Latin America who come for short periods. 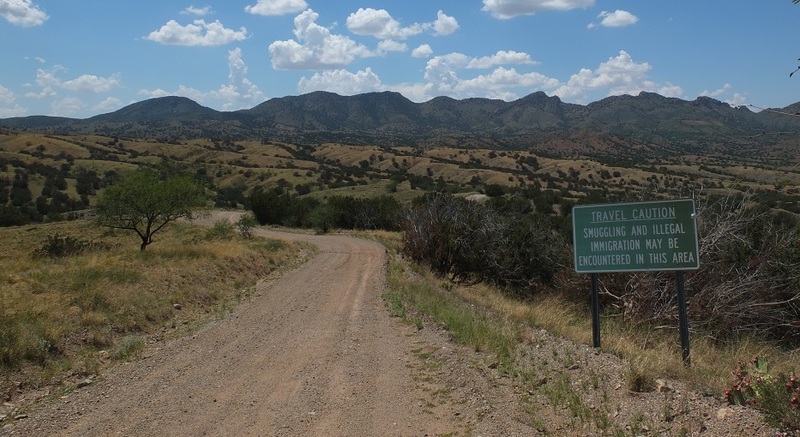 The State of Arizona in the Southwestern United States and the State of Sonora in Northern Mexico share a common mining heritage. Thanks to funding from the Pima County Observatory, Anne-Lise Boyer and Claude Le Gouill are exploring how mining activities are shaping the borderlands. First stop in their field trip: the University of Arizona Department of Mining and Geological Engineering. 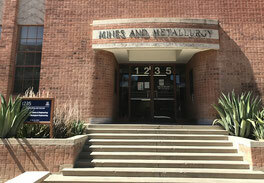 Founded in 1888, it is one of the oldest departments of the University and at the core of the mining industry’s development in the region. Observing Arizona's climate change sensitive savannas in France? Ecotron is doing it. Ecotron is a service unit dedicated to experimental research in ecology, as well as education and training. 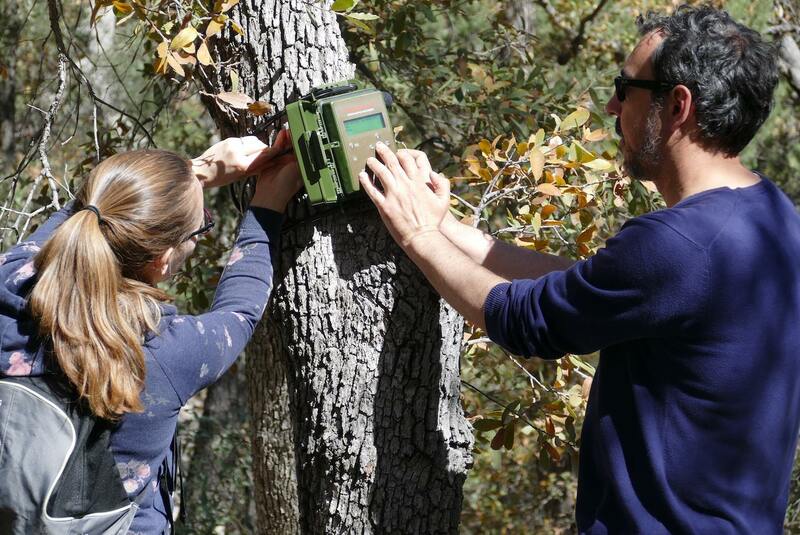 They have put in place an ecosystem that can reproduce any kind of climate, past or future. 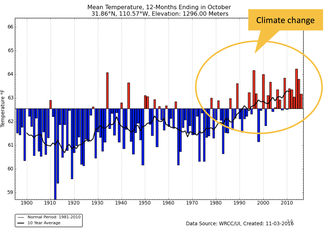 With this, the researchers hope to anticipate the effects of global warming. 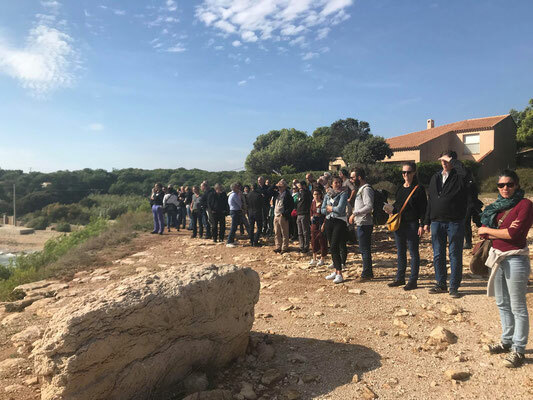 Greg Barron-Gafford, Associate Professor at the University of Arizona, went to France as part of an on-going collaboration on this project. See video (in French) from the CNRS Journal. For a research project on environmental health communication in the public and media sphere, French visiting scholar Brigitte Juanals (Aix Marseille University) accompanied by Jean-Luc Minel (Paris Nanterre University), conducted a dozen interviews with UA researchers from different fields (College of Public Health, Arizona Prevention Research Center, Environment & Policy Department, Center for Digital Society and Data Studies, College of Social & Behavioral Sciences). Following-up on these interviews, a research project is in the works focused on the media coverage of Biosphere 2. partnering with Biosphere 2, Center for Digital Society & Data Studies, School of Journalism and the UMI iGLOBES. 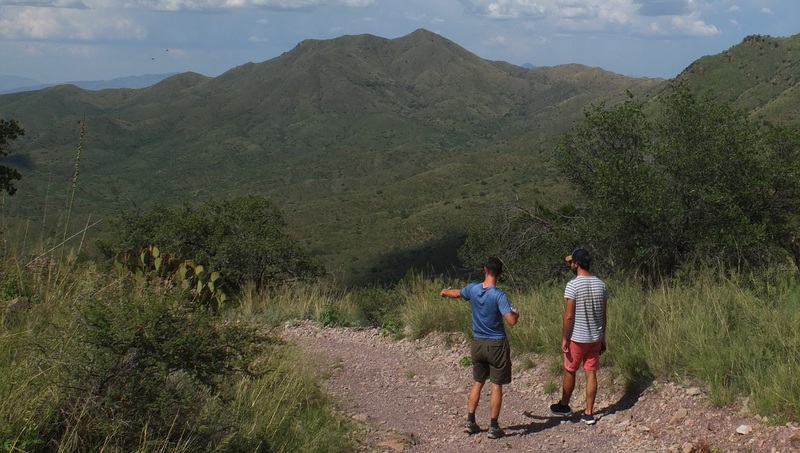 Among its research programs, the Observatory funds studies about the Man/environment relationship in Southeastern Arizona, focusing especially on the changes that might occur with the possible opening of the Rosemont mine. See program and list of presenters. 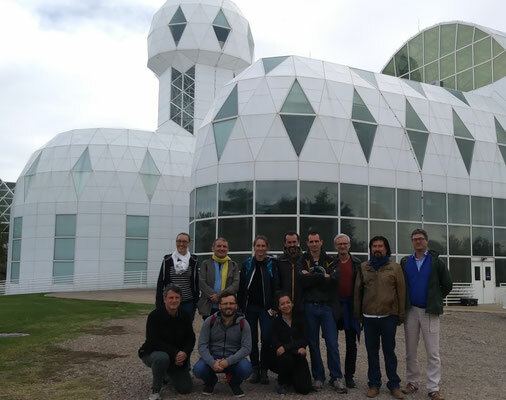 The workshop was designed to present on-going and recent projects funded by the Pima County Observatory, as well as promote contacts between French and UA researchers and disseminate information about the possibilities of funding for UA/France collaboration available under the iGLOBES research center. 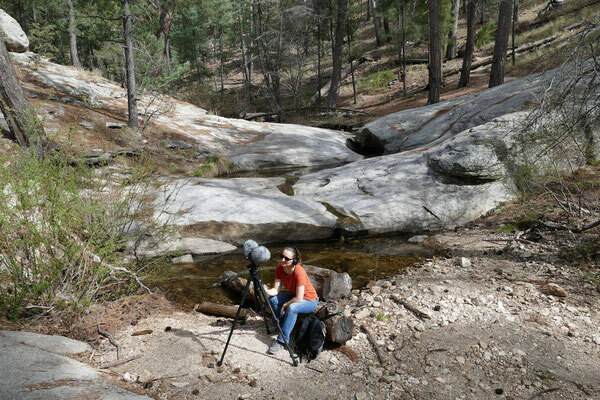 What can the sounds tell us about Pima County? As part of the Pima County Observatory, French visiting scholars Anne Sourdril and Luc Barbaro did recordings of acoustic landscapes, ranging from peri-urban to protected natural areas. To the left, a photo by Anne of a male western bluebird taken at Rose Canyon Lake, Mount Lemmon Arizona. 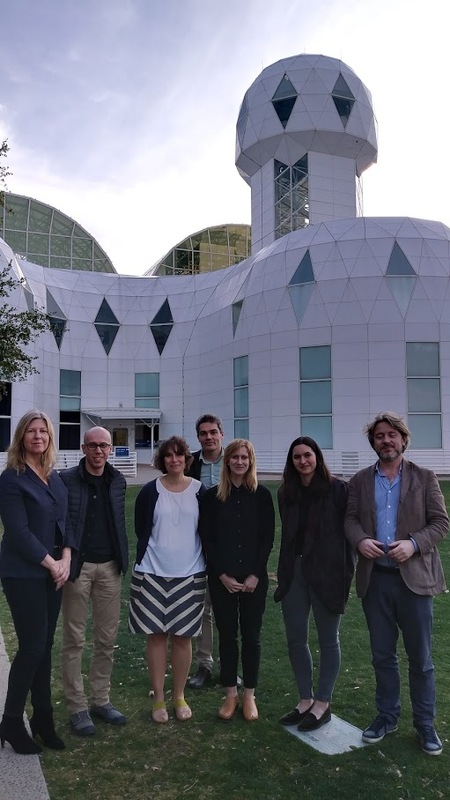 The UMI welcomed Dr. Minh-Hà Pham, Counselor and Pierre Michel, Attaché, for Science & Technology at the Embassy of France in the USA, and Jean Rosenbaum, Attaché for Science and Technology at the Consulate General of France in Los Angeles. 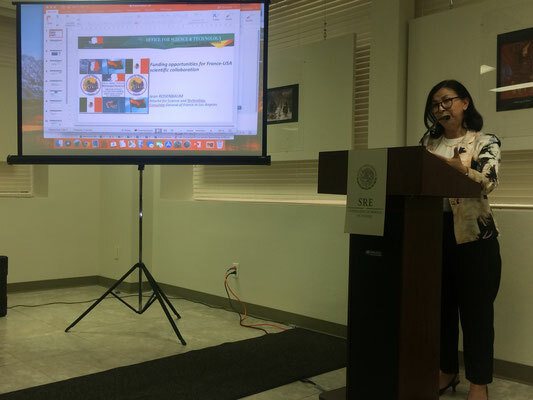 An informal networking meeting at the Consulate of Mexico gathered French scientists and tech entrepreneurs in the Tucson area, as well as US scientists interested in collaboration with France. 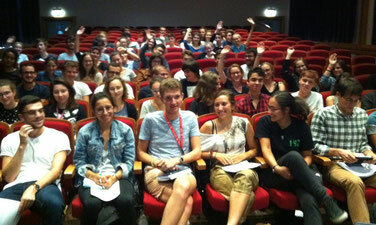 We've just finished setting up a collaborative space (Marshall Building, room 531). 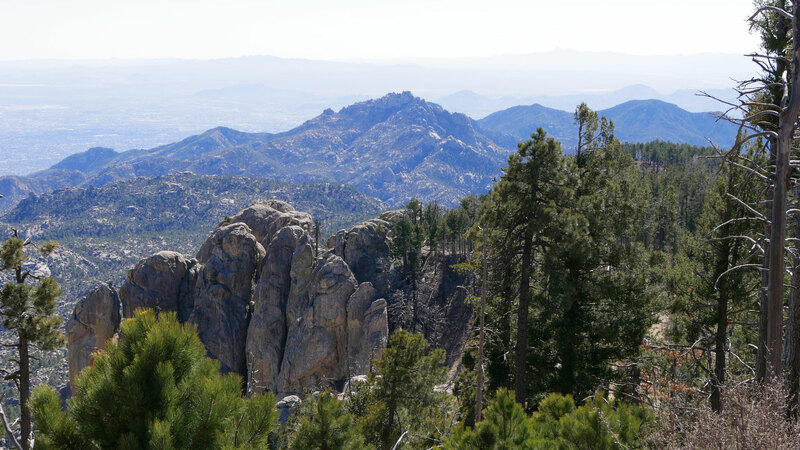 With a summit elevation of 9,159 feet, Mount Lemmon is the highest point in the Santa Catalina Mountains. 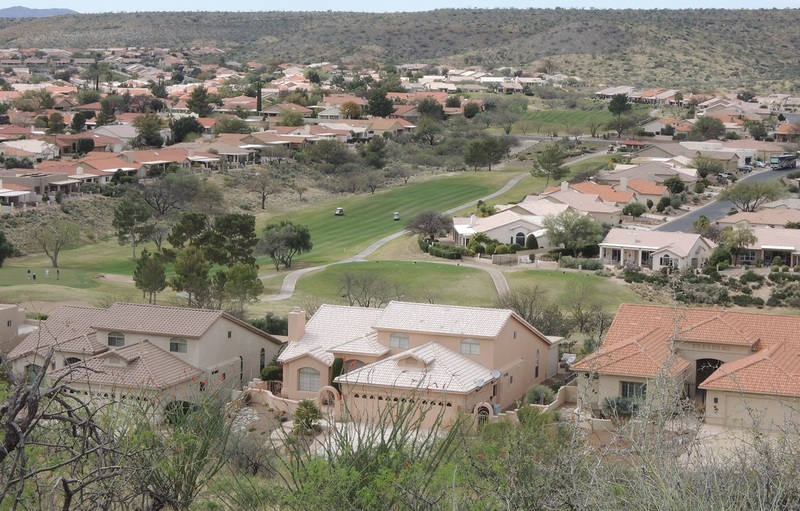 During her stay, French visiting scholar Pascale Nédélec (ENS Paris) focused on urban sprawl in the Tucson region. 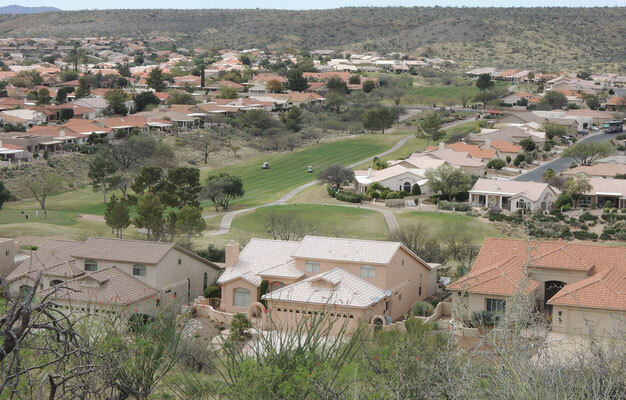 She explored Saddlebrooke, a master planned community on the Northern fringe of the city. The research will show how arbitration between social demand for upscale housing in the desert, political will to limit suburbanization and increasing pressure on water resources is necessary. The workshop aimed at breaking through disciplinary boundaries by bringing together a mix of astronomers, Earth scientists, ecologists, and anthropologists to discuss how our understanding of life and nature as integrated systems advances and evolves as we become able to assemble and control complex artificial ecosystems on Earth, prepare to send and use such ecosystems on the Moon and Mars, search for alien life and ecosystems on other planets and planetary bodies, and push the boundaries of our exploration of the distant universe. See further information and videos.